The average salary for a software engineer in Silicon Valley is over $100k per year, with similarly high rates in expensive cities such as New York, Sydney, London etc. If you live in an expensive city and can’t afford these rates you might want to consider hiring globally. This doesn’t necessarily mean hiring someone lower quality. At Time Doctor, I’ve been hiring developers around the world for many years now. Google recently “validated” our hiring methods by offering a job to a developer that we’d hired in Bangladesh. I often get questions from our customers and contacts on how & where to hire offshore. Here’s an overview of different approaches I’ve tried. 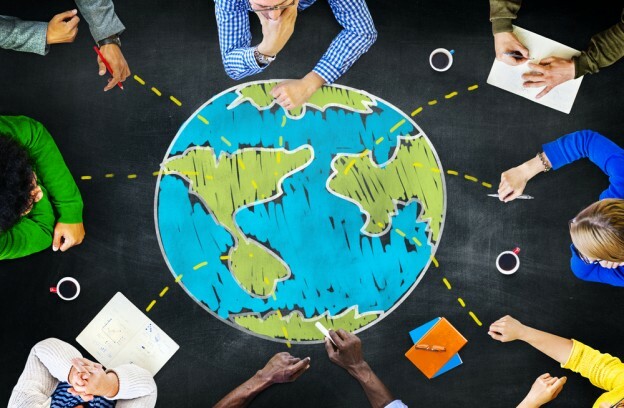 Should you set up a central office overseas or manage a distributed team? When you’re hiring overseas, the first decision you need to make is whether you’re going to have your developers work together in a central office or whether they’ll work remotely. If you’re hiring only one person you can skip this decision. Easier collaboration: If you have a larger team with everyone in the same office it’s easier for them to collaborate. Easier to manage attendance: There is some degree of discipline in having people come to an office and it’s easier to manage attendance problems in an office (although our software Time Doctor does make it a lot easier to manage attendance, whether in an office or not). There may be fewer distractions in a office: Some people have a lot of trouble with distractions from their children or wife/husband when working at home. Internet speed & stability: An office usually has higher quality Internet. In my experience this is important if your team is making phone calls though the internet, but isn’t usually an issue for developers. Cost: Hiring in an office costs a lot more (up to 100% more). The costs include: taxes, office rent, electricity, computers etc. Red Tape: There are a lot more red tape legal restrictions with an office. You need to comply with all laws in the country where you set up your operation. For example you may have to hire your developers as employees rather than as contractors, which means paying payroll taxes and complying with labour laws for hiring and firing. Taxes: You need to set up an entity in the country where you’re hiring, and need to pay taxes (or you need to hire an outsourcing company that pays their own taxes and passes the costs onto you). Geographic Limitation: You can only hire in one location (whatever city your office is based in). Office politics: There are generally a lot more office politics when people are working together in person. Commuting: Your staff have to travel to work, often in horrible traffic (for example most people in Manila in the Philippines are stuck in traffic for 2-3 hours each day on their way to and from work). So what’s the answer? I don’t think there is one answer for everyone; you have to make the decision yourself. For our company (with over 50 staff), we have everyone working from home or in their own personal offices. I love this arrangement and wouldn’t want a major central office for all the reasons I’ve listed above. But I know that a lot of serious entrepreneurs end up in an office or use a BPO (“Business Process Outsourcing” company) to hire their staff for them. After you have made this decision, then you have several ways to find great people. Although I’ve hired in a central office in the past, I have much more experience hiring a distributed team and have been doing it for many years. Your budget will be a factor in which countries you can hire from.. Are you trying to hire a developer in the Philippines at 40,000 pesos per month (a bit under $1000 USD), do you have a higher budget ($2-4k/month), or are you willing to pay western salaries of $6-10k+ per month? http://weworkremotely.com/ – This is a website started by the Basecamp guys and costs $200 to post a job. It has some non-technical jobs as well. This site is ONLY for remote jobs. http://careers.stackoverflow.com/ – The cost is $450 for a 30 day job listing if you’re in the US, but it’s less in other countries ($250 for most other countries, and if you’re not hiring into an office in the US you can easily state your location as somewhere else). You’ll probably have 200-400 candidates applying for the job if it’s a 100% remote job. Make sure you select the “remote work” option. Put in the job title that you are looking for someone remote. If your budget is only $2-4k/month you’re probably going to exclude everyone in developed countries so you’ll only be able to hire in countries where this is an acceptable salary level. These countries include: Russia, Ukraine, most of Eastern Europe, Egypt, the Philippines, India, Pakistan and Bangladesh. It may be better to make it clear in the ad which countries you’re looking to hire from. Even if you do this you’ll still get a lot of candidates from the US but there’s likely no point in discussing the job with them as the salary is too low for the US, and if you do get someone to accept this salary there’s probably a strong negative reason why they’re willing to accept a lower salary. I believe that running a coding competition is a great way to find people. I’ve not personally tried this but if Google, Facebook, Microsoft and most of the tech giants do it, it’s probably a good option. You can sponsor a competition on sites like Hacker Rank (affiliate link), but this is not cheap (it will set you back a few thousand dollars). Which countries to hire from? It helps to keep an open mind when considering where to hire. Sergey Brin, one of the founders of Google, is from Russia. There are great people from dozens of countries around the world working as founders or in top technical positions for some of the more prominent tech companies. My point is that you can find great people anywhere. Having said that, my experience is that eastern Europe has a higher signal-to-noise ratio, so that a larger percentage of the applicants will be of a higher quality and experience level. I find that it’s harder to find great developers in India. There are plenty of amazing developers in India but my experience is that they are less likely to be the ones that are applying to your job post, and that you’ll get a lot of very average developers applying from India. What to do if your budget is restricted? Eastern Europe: Bulgaria, Serbia, Macedonia, Hungary, Romania, Ukraine, Moldova, Czech Republic, Belarus and Russia. Asia: China, Vietnam, India, Pakistan, Bangladesh, Indonesia and the Philippines. South and Central America: Mexico and Argentina. Outsourcely – A global talent marketplace with remote workers from 132 countries looking for mostly long term work. Unlike Upwork, Outsourcely lets you hire directly and pay zero fees. Prices start at $9 – $99 /month depending on how many individuals you’d like to interview and how many jobs you’d like to post. Outsourcely’s platform also makes it effortless to interview and hire talent with their real-time communication tools built right in. For example, you can connect with candidates immediately using real-time private chat, browser to browser video & voice calling, video & voice messaging or just regular email. This makes hiring fast and easy. Best of all, Outsourcely is giving all TimeDoctor customers a 30% discount. Just enter “staff30” to get 30% off all plans. Upwork (formerly oDesk) – Huge platforms with a lot of people who want to work from home. You can find great people on these sites, and although you can also use them for higher salary jobs, my experience is that Stack Exchange is much better for higher level jobs. Upwork make their money by taking 10% of the person’s salary. Elance charges a similar rate. Although Upwork and Elance are separate websites, they’re owned by the same company. OnlineJobs.ph – A site specifically for the Philippines, it has a large database of candidates and lists their local salary amounts in pesos. You’ll find that candidates tend to charge more when you list a salary in US dollars. If you pay in local currency you can tend to get close to local rates. It costs around $49/month to use the site. There are other places you can try many of which are free such as: Craigslist Manila, BestJobs, joblist.bdjobs.com. I haven’t had very good experiences with any of these sites, but since they are free, no harm in trying them. GitHub jobs page – a great way to hire high level developers. TopTal – prominent outsourcing company that will find talented developers and they charge a percentage of the person’s salary (I’m guessing around 30%). Their developers work from home and the rates for their developers are mostly at western levels ($8-12k per month for a full time developer). Freelancer, Guru, PeoplePerHour – Outsourcing platforms similar to Upwork. If you are specifically hiring WordPress developers, here are some good tips for finding them. Hire a “seat leasing” company that makes office space available to the people you hire. The seat leasing company may also handle salary payments, but does not get involved any hiring or management. Set up your own office. A BPO will usually charge a fixed percentage on top of the salary you’re paying your developers. The BPO wll be responsible for hiring under your specifications. If the cost of using a BPO isn’t an issue for you, then the main thing to consider is how effective they are at hiring great people. I’m not personally a big believer in letting another company handle your hiring as this is a critical part of your business. Even if you do hire a BPO (or a recruiter) to do it for you, it’s important that you participate in the process and evaluate the candidates in depth yourself. So in my opinion BPOs are usually not worth the extra percentage that you’ll be paying. The feedback I’ve heard from friends who have used BPOs is very mixed. Some love the experience and others haven’t gotten great results. It really depends on the BPO and the person within that BPO who will be responsible for recruitment. I don’t have any recommendations of BPO companies however I can suggest if you’re hiring a BPO in the Philippines to check out Mike’s Manila Tours which is a 3rd party independent service (they don’t take commissions) that will take you around to visit all the different BPO operations, and also show you how to find a company to handle your seat leasing. Seat leasing companies usually charge a fixed monthly cost for each employee that you have. Your employees will share an office with other businesses, and the seat leasing company may also be able to handle basic HR, payroll and local payroll taxes. This should work out to be cheaper than using a full-service BPO. What seat leasing companies don’t do for you is recruitment. So what to do? You can either do the recruiting & hiring yourself, or you can hire a recruiter who will find someone for you at a fixed cost. If you hire a recruiter, make sure you get a good one (not easy!). You’ll need to set up a company in the country where your office is located. With that company comes a lot of legal obligations and hassle. You don’t have as much flexibility. You can’t scale up or down as easily. A lot of up-front time, effort and money are needed to set things up. I think that for larger companies with 100 or more staff it’s something to consider, but for the vast majority it’s not a good option. One option you can consider is to build an office around your initial hires. So if you manage to find a great developer in Ukraine for example, then subsequently look for future developers also in Ukraine. Then eventually set up an office or enter into a seat leasing arrangement and have everyone come into the office. You can also be flexible and let your team mostly work from home but have them meet up once or twice a week. This could give you the best of both worlds, having the flexibility and low cost of hiring from home, but also having regular meetings in person. What I’m referring to here is hiring a company with several developers to handle an entire project for you. This is a really bad decision if the technology they’re building is central to your company. If you hire a pre-built team there’s an inherent conflict of interest. Their interest is to do the minimum work necessary to maintain you as a client while going off searching for more clients and more revenue. Your interest is to get the best possible development team that you can, and you want your developers to be dedicated to you and you only. The problem is that the developers work for their direct employer. Since you haven’t hired them directly, they’re not fundamentally loyal to you. The exception is where you have a defined project and where the technology is not the core of your business. In this case it’s ok to outsource it to a person or a team (perhaps at a fixed price) to just get it done. If you’re not a developer you’re going to struggle to evaluate candidates. In fact you’re likely to have absolutely no clue whether someone is a great developer or not. My personal experience is that the most eloquent and well-spoken people are often not the best developers. I could barely understand one of our best developers when I first met him, but now after working several years together, his English has improved a lot and he’s a great member of the team. There’s a specific process that I use for all of our technical hires which is to give developers a test from Hacker Rank (affiliate link). This is a service used also by companies such as Facebook, Yahoo, Evernote, Airbnb and VMware. Hacker Rank will give your applicants a very difficult programming test, and when they submit their code it automatically checks if their code is correct or not. It costs $199/month to give 25 developers per month the test. Hacker Rank can also create a custom test for you for around $1,000. 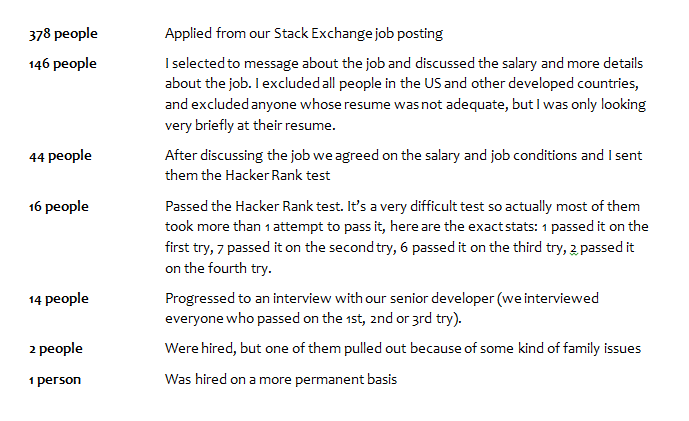 What I do is give our applicants one of Hacker Rank’s custom tests before we even interview them. This gives me a good idea whether the person can solve difficult problems. The vast majority of applicants are willing to do the test. Note that I didn’t personally interview anyone. I’m not a developer, so what do I know? Plus I didn’t have the time to conduct all of the interviews. Tell me about your prior work history and other experience. Are you working for a company right now? What is the largest team that you worked with? What is MVC? Please give me some details about how it works. What’s your favorite framework and why you are using it instead of another framework? Do you have experience with Symfony? What’s the purpose of the static keywords in OOP in PHP? Can you be online on Skype the whole day and can you call people immediately when needed? How do you feel about working remotely? What’s the status of your social life? Are you aware that working remotely can be bad for your social life if you don’t have a family or don’t have a lot of social life outside of work? Whoever you hire, it’s a good idea to consider the first 1-2 months a trial. This gives both of you a chance to get to know each other and make sure that it’s a good fit. Even if you’re happy with each other, the developer may find that they dislike working from home if it’s their first experience doing so. Because the developer may not stay beyond the trial for whatever reason, it can be a good idea to consider hiring two people for the job on a 1 month trial and then selecting the person you like best at the end of the month (assuming that one person hasn’t dropped out). Another way to run a trial is to start by hiring the developer for a fixed-priced project. This allows you to get something done at a defined price and also test the person before hiring them for more on-going work. If you’re not hiring into a central office, the best places to hire someone for project work are Upwork or Freelancer. One thing to look out for with this approach is to make sure that the person is interested in working full time after the initial project work. Often developers who are working on a project basis may not be as reliable or willing to work full time with you as they already have their steady base of clients that they’re doing project work for. How to pay your remote staff? There is no “developer shortage” if you’re willing to open your mind to hiring globally! In Silicon Valley there is constant talk about the shortage of good developers and the war for talent. Of course! When you have Google, Apple, Microsoft and hundreds of other companies competing for the same talent, it’s an incredibly competitive market. If you broaden your horizon and consider hiring from any country and any city around the world, your chances of finding someone amazing are much higher. In my view it’s very restrictive to only consider hiring from the one location. The whole world is your oyster, so take advantage of it! Please also write article on hiring offshore development team after GDPR? Many have lot of ambiguities after GDPR. Pakistan has amazing software development talent, Only challenge they don’t have Paypal. This is really a full ultimate guide for non-tech founder who’s looking for hiring or tech co-founder and what a coincidence I was looking for a guide like that and at the same time I was going to look for service like Timedoctor to keep track my team. Good effort Rob in this article I will make sure to refer people to it and I think you got new customer because of this article. Great to have you on board, Saleh! This is what I call a complete guide on hiring offshore development team. It is not easy to hire a developer that you can trust. There are a lot of freelancers nowadays that have difficulties in committing to a certain project.We need a trust worthy developer and indeed its not easy to fine. Good on you for using a coding test. Too many people skip that part of the screening process, which is terrible. How do you evaluate someone’s skill level if you don’t see how they use their skills in the first place? Hacker Rank is pretty good, as well as testdome.com and a few others. Some companies use their own in-house testing platform, but these third-party services are a good choice. I have one question. How to handle taxation for offshore remote employee and what type of contract the employee should sign (1099, w2)? In the process of hiring a developer now, and will take many of these points to heart — thanks for the article, Rob! 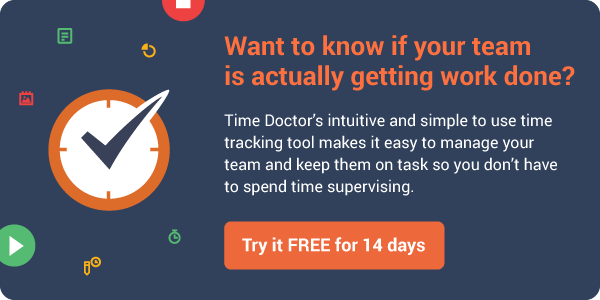 Actually, I been using Time Doctor when I am a freelancer. I am no against with Time Doctor because it can measure the time that I am allotting on my project. This should be also consider in having an offshore development team.